Wine Glasses Party 12.75-Ounce set of 12 This set includes twelve elegant 12.75 ounce wine glasses that are great for either red or white wine. The narrow, tall stem makes them comfortable to hold in your hand. Dishwasher safe and made in the USA. 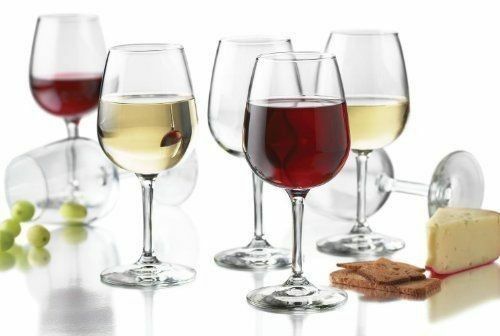 Twelve elegant 12-3/4-ounce clear all-purpose wine glasses 7-1/2-inch tall Made of glass Great wedding, housewarming, bachelor or host gift Contemporary design; dishwasher-safe Made in USA Payment We accept ONLY PayPal for payment. Final Price No TAX Shipping Handling We have warehouses and certified suppliers from all over the world for the item We usually take 2 business days to ship this item after received payment. Free Standard shipping and Usually takes 3-5 business days for the delivery. Shipping is within the continental 48 U.S. States only No shipping to Alaska, Hawaii, Puerto Rico, Guam, or the Virgin Islands No shipping to Canada or Mexico No shipping to APO and PO Box addresses and there is no local pickups. International Shipping / Global Shipping Program: - Some of our products qualify for and participate in the Global Shipping Program which allows customers from selected countries outside of U.S to order our items. Please check the availabilities and shipping rates by seeing the Shipping and Payments menu above. - The item will be shipped to the Fulfillment Center which will process the international shipping procedures for you. After the item has left the facility,the international tracking code will be provided. - It could take anywhere from 11-25 business days for the item to arrive at your destination. - There will be a surcharge of 6% which will be billed to your PayPal after purchase to cover the procedures needed in order to ensure a smooth delivery. - You are hereby responsible for checking with customs of your country for product import. 100% Satisfaction Guarantee If you are not satisfied with the product you purchased for any reason. Please contact us for a return instruction within 14 days for a refund. Shipping Handling costs are not refundable. Return shipping cost will be paid by buyer. Note: Customers satisfaction is very important to us!please email us before leaving any Negative and Neutral feedback or open any dispute on paypal.otherwise it will hurt both of us. Please give us the opportunity to resolve any problem. We understand the concernsand frustrations you might have,and will try our best to resolve the issues.. only! Thank you for shopping.